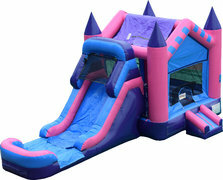 The name says it all, our combo moonwalk rentals are the perfect combination between a bounce house and a slide! combo moonwalk rentals continue to be some of the hottest items at Wace Bounce House Rentals, as they provide the ultimate party experience for guests of all ages! Each combo bouncer features a large play area that leads kids into the attached slide, which can be configured for either dry or wet use! Perfect for any occasion or event, our combo moonwalk rentals are sure to bring a smile to every one of your guests! Make your reservation today!